Blackbarrett Limited Edition T-Shirt Giveaway!! 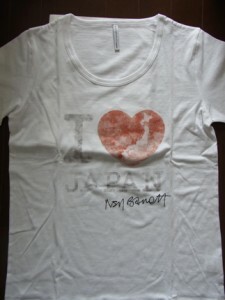 Guy Perryman Black Card Members have the chance to win Blackbarrett limited edition “I Love Japan” T-shirts signed by designer Neil Barrett & Fuji Rock Festival 2011 artists interviewed by Guy!! More details here on the website about who has signed & how to win yours after the Fuji Rock madness!! If you do not have a Guy Perryman Membership Black Card – email membership@guyperryman.com with your full name & postal address & we’ll send your card. In the meantime have a look at the Blackbarrett collection.. This entry was posted on Wednesday, July 27th, 2011 at 12:49 pm and is filed under Check-In News. You can follow any responses to this entry through the RSS 2.0 feed. Responses are currently closed, but you can trackback from your own site.